1) Yes, the MAP sensors operate exactly the same. 2) No, you'll need a different knock sensor for the '7730. 3) You can get a 1227730 ECM out of many FWD V6 cars. Look at early 90's Corsicas, Berettas, Caveliers, Sunbirds, etc. Then get the V8 memcal from the dealer or gmpartsdirect.com. 4) I'd recommend fixing whatever is broken before you start the conversion. Then it will work smoothly with the new setup. I just repinned a 747 to a 730. Everything went great thanks to this thread. I have one problem though.....I am getting a constant code 41....anybody run into this? Very strange. Sounds like you have a 4 or 6 cylinder MEMCAL. Get one for an 8 cylinder. Code 41 is cylinder select error. do you know what motor, the 3.1? I'm gonna go with an electric speedo, i was looking at a wiring diagram 2day and with the electric speedo, there's a terminal in the back of it, that you splice into your vss. Even with my stock speedo not working, my truck still ran normal, but i got an engine light for vss, my speedo wouldn't work and my odometer wouldn't work (this is with the tbi) an/ ideas? Rest of my gauges worked. Last edited by GCash; 07-08-2005 at 12:48 AM. I picked up a '91 tbi car this week, so I'll be doing this remap on my own car.. woot! I read eariler that the SD system doesn't use the ESC module and to jump pins M and D (just put some letters in there) to get the knock sensor to work properly were are these pins located?? Do i need to put a resistor or something in there?? No, you connect those two wires that are in the connector for the ESC module. I updated the tables and info in this thread. Hope you all find it helpful. The '746 repin should work on both a '746 and '747. So i does use the esc module (spell) what 2 pins do i need to jump. Also while repinning my harness a purple/ with a white strip wire fell out of my connector and i don't know where it goes, i followed it under my dash and in the diagram for my S-10 and its goes to a 3 amp CRANK fuse. I could find it on my conversion chart. Don't remember the which pin off hand. But it was like C10 or something and C10 wasn't even on the chart any ideas? No, unplug EST, and jumper C and E together..
You need to go back, and re-read the first few posts in this thread before you ask questions that are clearly explained. another question, does it matter to the computer that the emissions stuff isn't hooked up? like the purge valve thing, and those wires that go into the air box thing? I have a map setup, and it has a wire off of the egr valve, i didn't see a spot for this in the conversion chart does the sd not use this? it just uses the egr box on the intake manifold? Is anyone using a 730 ecm to control an FI setup using a standard carb manifold(or dry manifold drilled for injectors)? What TB are you using? anesthes, I think I saw in this thread you're doing something similar (except with a v8 and boost). Would it be feasible to reuse the stock TB minus injectors and stuff? Exactly what are the benefits of using a 749 puter over a 730 for boosted apps? This swap sounds very appealing and I may go SC in the future, so why would I want to use the 749? Also is it harder to find in the JY vs the 730? Also, I will extend the TPS and IAC wires. Now...my question is this. I found the actual '730 ECM harness plug with pinout numbers. Where can I find a pic like this, but for the '746 ECM harness plug? Basically, I don't want to confuse the pin numbers on the '746 before I get started. The '746 connector is allready numbered. Best thing to do is take the locks off the connector, and label each wire, then unplug them. Or you can label them, and go one at a time between the '746 to '730 connectors. Well the computer itself doesn't matter. It's the code thats better for the boosted setup. The $58 code with a 2-bar map sensor will allow you to fuel and spark to 190kpa (roughly 15lbs boost, depending on elevation). The $8D code won't see anything beyond 100kpa, so you can't control what happens under boost. (So you would need ignition retard, and a fuel management unit). The '749 and '730 ECM is almost identical. The '749 has an extra Injector driver which you don't need. The only real difference between running $58 and $8D pinout wise, is the IAC is wired differently, and the injector banks are swapped. (which doesn't matter in batch fire anyway). So it's easy to go back and forth between $58 and $8D. That's awesome. I'm looking forward in doing this soon. Am I missing anything for those of you who have done this already? 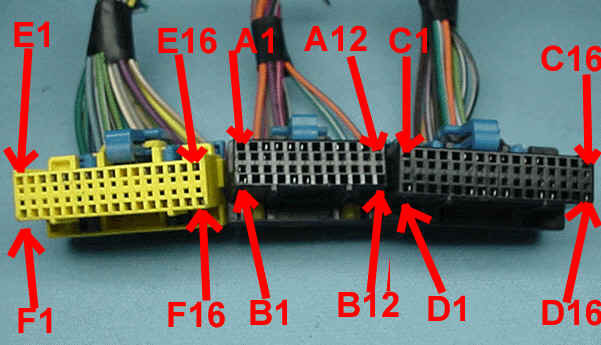 is say put pin A10 from the 746 connector into pin c6 for the 730 connector, but there is no current wire in that pin out on the 730 wire, and what do i do with pins b9,b10, b11, and c1 from the 730 connector ? second for the c14 pin out on the 746 connector.. its a ground for the TPS and the MAP do i need to run one both to the A4 and A5 pins on the 730 connector or just one since from the schematic i have they seem to be wired together ? third is a injector issue... first i assuem for the grounds for th injectors i just have to ground 2 wires and put them into the pins for D6 and D7 on the 730 connector. 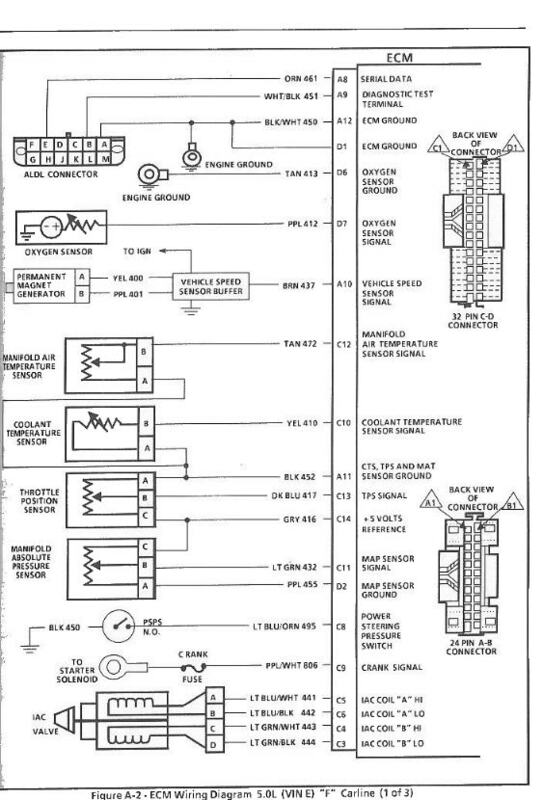 after that looking at the 91 tbi schematic there is 2 pins for each injector for both of the injectors on the 746 connector... for the LH side there is D14, and C15, for the RH side there is D16 and D15. what ones do i use or does it matter ? last is on the 746 connector at pin C9 there is a purple and white wire that goes to the diagnostic energy reserve module... do i need that for for the 730 ecm or not ? First off, start by removing all of the pins from the '730 connectors, and then mark the '730 connectors with some white-out or something so you don't get them confused with the '8746 connectors (two of which look exactly the same). Then start to move the wires from the '8746 harness on the vehicle to the '730 connectors one by one. I'd recommend doing it like I do above. Go ahead and put A10 from the '8746 into C6 on the '730, and take the two wires from the buffer box (ppl and yel) and put the ppl into BB9 and yel into BB10 on the '730. C14 on the '8746 is actually the +5V reference signal for both the TPS and MAP sensors... You can "Y" that wire (use the spare pins and little wires from the old '730 connector that you took out) and put one side into BA4 and one into BA5. Yeah, it's a weird setup... Just pick one set from the '8746 harness (D15 and D14) and put those into the '730 (BC11 and BC12).. I just taped the others off. I did nothing with that wire. According to my '91 Service Manual, C9 is Crank Signal.. I looked up what it did a long time ago. The wire has a +12V signal while the engine is cranking (maybe for some kind of fueling routine?). Don't need it with the '730. The guy doing my swap called and said the TPS connector is different between TBI and Speed Density. He found that out when he went to reconnect it. I had to buy a connector. Just FYI. Late model TPS sensors for TBI have a different connector. The early TPS is the same as all TPI apps. Vortec apps use the different (smaller) connector as well. Car: 88 Camaro sc vert. Hello.I was wondering if it would be possible to repin my 1988 camaro lo3 harness to 1227730 ecm using this method ? My car doesn't have the mentioned 1228746 ecm,I have a 1228063. I have used the search for the past couple of days trying to see if the two TBI ecm's used the same pin-outs,and haven't found anything to support that they do. I was also wondering if anyone had a copy of the chart that anesthes explains on the first page of this thread ? I only see red X's where the document was. Ok,The above questions have been answered( Thanks Anesthes ),but I have a couple more Q's that need to be addressed before I take this car apart. 1) I beleive I will need to buy the correct MEMCAL with the VATS disabled since my car never had VATS.Is this correct? 2) What should I do for VSS? My Camaro has a cable driven speedo that has the VSS buffer on the back of the cluster. There is no VSS in the trans. obviously, but there is a yellow and a purple wire (not connected to anything) located near the tail housing of the trans. I have seen that Painless sells a 2 ppr(pulse per revolution) VSS ,and a 4 ppr pn#60116 that seems like they could go inline on the speedo cable.Would something like this work,or is there some better/less complicated factory vss I could use ? 1) They don't make a factory one with the VATS disabled for the SD puters as far as I know. You can get one off someone off this site for a few bucks though. 2) I know with 86-89 MAF cars, pin A10 on the ECM is the VSS signal coming off the back of the speedo. That wire should go to BC6 on the 7730. Also the chip will have to be set to Optical VSS instead of the Magnetic. I don't have the TBI wiring diags for camaros that year but year, look it up, and I'm sure you'll find the correct answer. Yup, it is A10 also for the brown VSS wire for your camaro. 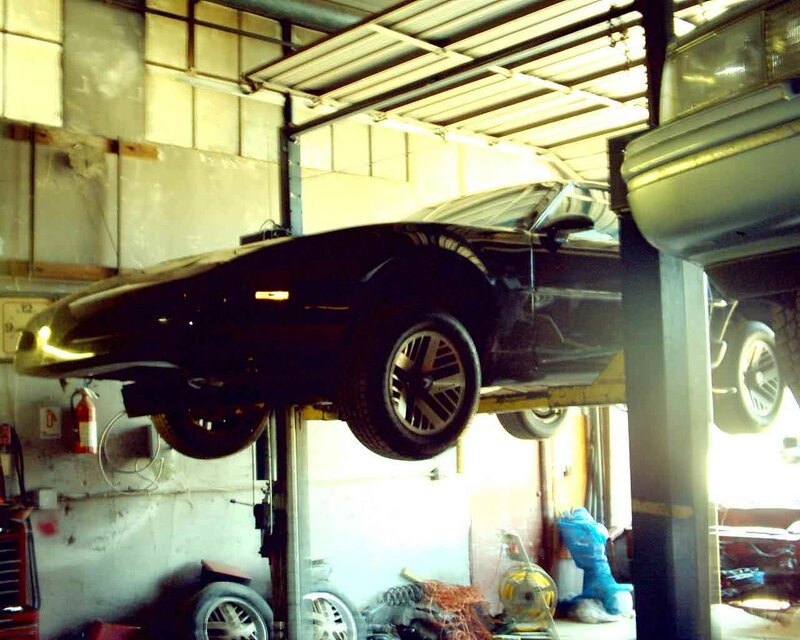 I just finished the re-wiring of my 1991 firebird. I had a few questions. First of all, there are 4 wires left over. What are these? Now, I know one of the them was C15 on '746 harness and some other pins. But I was wondering if I could use any of them to feed my Fan switch wire (Dark Green/White) outside? I mean, do they actually go to something in the engine compartment that I could splice off to goto my Fan Relay Switch and hook them up to GE8? Okay, I can't get my Datamaster program working. I tested this same equipment on my wife's 1993 Suburban, so I know my ALDL cable, Laptop and software works. I called a buddy of mine who has a Snap-on scanner, and he said he'd try to bring it over here this weekend. But if anybody had this problem before, can you enlighten me? When I turn the ignition on, my check engine light comes on, my Fuel pump kicks on, all the relays click once, so everything seems to be working. I also connected pins A-B and got code 12 repeatedly (which I think is normal). But my injectors don't seem to be firing, and I checked the wiring to them. Is there anything I'm missing. Has anybody ran into this problem before? VATS, are the wires pinned correctly, did you add in the injector connectors and did you tie the two green and two blue wires that were for the ol TBI injectors together? I noticed another set of Blue and Green wires at the ECM that didn't appear to go anywhere. Do I need to splice them together with their corresponding colored wire that I have connected at the ECM? BTW, I disabled VATS on my PROM. Okay, I've figured the reason I couldn't log data with my ALDL. It's because unlike regular 1227730 (speed density) wiring to the ALDL connector, Pin E and Pin M are NOT connected together via the orange wire for 1228746 wired cars. You can see it in these diagrams I found. I plugged my 8192 baud connector (that suppose to goto Pin M) to the 160 Baud Connector (Pin E), and I was up and running on Datamaster. Now I have to figure out why my fuel injector are not pulsing. Hopefully I'll have that answer tomorrow. Last edited by kaylin4u; 07-07-2006 at 06:17 PM. I always wired my aldl cable direct to the ECM on pin A8, so I never ran into this. Good tip. On my Vette I havn't even looked at the ALDL port. No, there should be 2-3 wires left over if I recall. more if you have an auto transmission. I think there was an additional wire going to the ESC module that wasnt used, or something along those lines, but I used that for fan control. Make sure you flip the fan bit on the prom. I think default is "N.O. Fan operation" and you want it the other way. I'm now reading my ECM, but still are not getting pulses to the passenger side injectors. My fuse was blown for my injectors, so I replaced it. I put the noid light on the drivers side, turn the ignition to the on position and no light. I turn the engine over and I get the light flickering. I then hook up the noid light to the passenger side, turn the ignition to on, turn it over, then no pulses. I made sure I had continuity to Pin 12, and it's okay. I made sure I had continuity to the fuse panel. Could I have a bad ECM? NOW I feel like crap! I looked over the '746 diagram and both the red and white wire went to one fuse. That's not true for this car. I looked over the '7730, and it shows two fuses, so I thought hmmmm....maybe I better look over my fuse panel a little more. Low and behold, above the fuse that was blown was another fuse with the letters scratched off. It was the second Inj fuse! It was blown. I replace it. Now my noid light is pulsing on both sides. I can't believe that! It is so true that this is REALLY a simple process to convert over to Speed Density. I don't know how those fuses got blown. I remember being careful when I was soldering this week, but it really doesn't matter. I'm going to try and fire this 383 with HSR up tomorrow evening when I have more light! Thanks so much to everyone here! I have another question. My original relay for the fan supply wasn't working. I took another one off the car and am attempting to make it work. I may have my fan wired wrong because it's not kicking on at my temperature I set up. I ran the pin from the ECM to the green wire on the fan relay. But does the ECM ground that green wire, or does it supply a 12 volt supply to to the relay? I've already tested the fans, but am not savvy when it comes to relays. 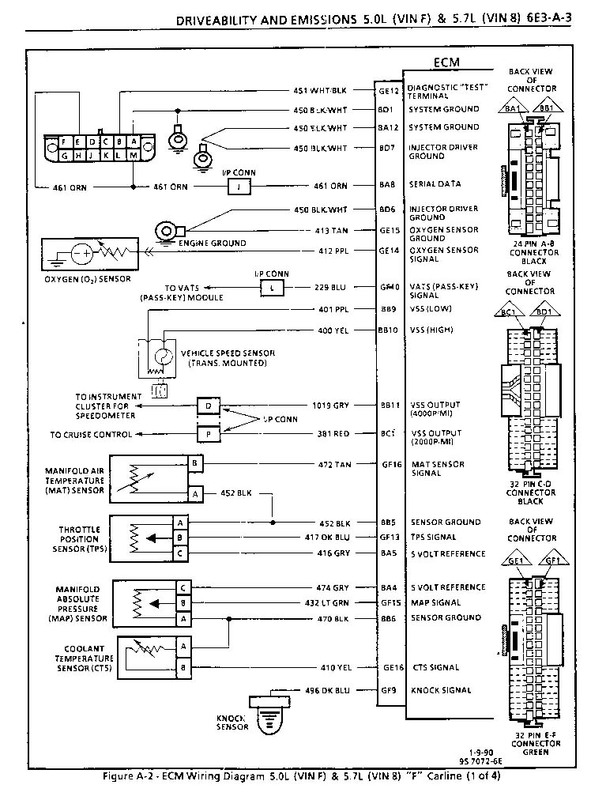 I found a wiring schematic. All the ECM does is ground the green wire. The 5 volt reference is gray (C14) Map signal is a Light Green (C11). Map Ground is a Purple (D2). BUMP. I am a little confused if I were to do this to my 91 rs would I just follow the first few posts? I guess I am just wondering if this info is streamlined to read right or not. I dont want to follow posts 1-10 and then wonder what the hey. Also there were some people left answerless. The best way to do this, is just follow the first posts regarding the re-pining. If you run into problems, just post your questions here and I think you'll get your answers (at least that's what I did). My car works great and I LOVE Speed Density. If i am going for a boosted setup but using the 7730 do I wire it as a 749 or just wire it as the 730 and change the prom? I am confused there. Wire it up as a '749. I ran the $58 code for a couple years and.. Eh.. If I went to a blower again i'd probably stick with the '730 $8d code and run a BTM and FMU. I am going to be running the $59 code. I just need to know what way to wire the ECU 730 style or 749 style. Ok well I read through the whole thing and myquestion is as follows. I have an 88 GM Z71. The plan is a Single turbo 383 TPI setup running 10 lbs. How do i re pin my 747 to the 749 ? I read the chart on the first page but they are both for the 746. And am I correct in understanding that you CAN use the 730 instead of the 749 and just use the 749 code with the 730 ?